Journey through a land of contrasts—skyscrapers and ancient temples, serene gardens and bustling city streets—to discover the heart of this ever-changing country. 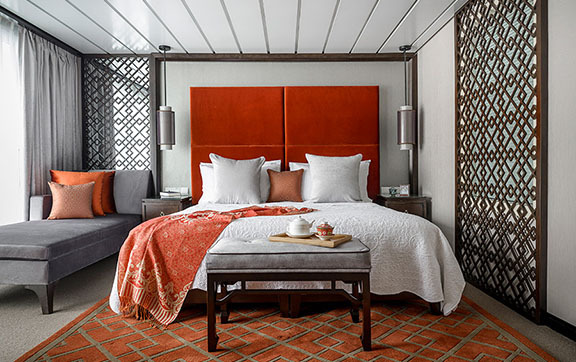 From China’s staggering architectural monuments—the Forbidden City, Summer Palace and Great Wall—to the natural beauty of the Yangtze River’s Three Gorges, this itinerary introduces a discerning traveler to China’s highlights. * All prices quoted are PER PERSON based on twin share in Australian Dollars and include taxes, fees and port expenses (if applicable). 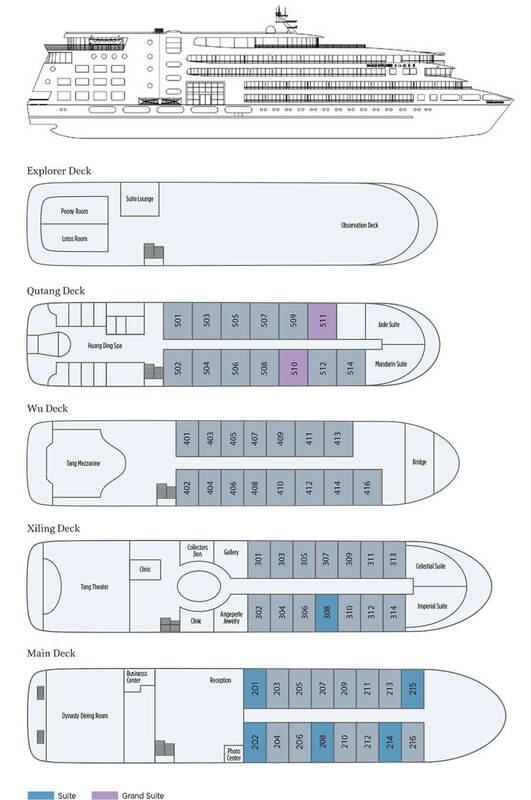 All prices quoted are for the cruise departing on 05Oct19. Certain departure dates and embarkation points may be at an additional supplement. For more information please contact one of our Travel Specialists. Your adventure begins with two quintessential experiences in China’s capital city. Off limits to commoners for 500 years, the Forbidden City was once considered the cosmic center of the universe (and for good reason, as you’ll see for yourself). Peking duck is another cultural gem you’ll experience today, a dish originally prepared for Chinese emperors. Today’s sights encompass some of China’s most iconic images, from the smiling faces of giant pandas to the massive Great Wall. A stop at the panda habitat at the Beijing Zoo lets you see these charming—and endangered—creatures in a gardenlike setting before you expand your experience of the city’s traditional culture with a visit to the hutongs. These historic residential neighborhoods developed around the Forbidden City during the 15th century. Traditional multigenerational homes built around courtyards line the narrow lanes, along with tiny shops selling everything from luxury goods to everyday necessities. Not only are the sights along the winding streets fascinating, but you’ll get to see them in the most traditional way—via rickshaw. You’re in for another taste of tradition as you take a seat at a teahouse and breathe in the delicate aromas of China’s most famous export, savoring a cup of tea presented with graceful ceremony. Though the Great Wall stretches 5,500 miles (8,850 kilometers) through northern China—for comparison purposes, remember that the United States is about 3,000 miles (4,828 kilometers) wide—part of it is surprisingly close to Beijing. You’ll head off to see the longest man-made structure on Earth this afternoon. The wall was begun in the third century BC as a way to keep out hostile invaders from the north; it proved so stalwart a defense that generations of warlords and emperors maintained and extended it, although it was never a continuous barrier. The section north of Beijing dates mostly to the Ming Dynasty. Now that its military purposes are firmly in the past, you may clamber up the steps and take a memorable walk along this UNESCO World Heritage Site. Its stone and tamped-earth pathway offers an extraordinarily peaceful and awe-inspiring setting with expansive mountain views. Leave the hustle and bustle of Beijing behind today and head north to the serenity of the Summer Palace, home to one of China’s most beautiful classical gardens. From there, plunge into the past in China’s first capital, where you’ll celebrate your first night in Xi’an with a traditional (and incredibly labor intensive) dumpling banquet. Leaving Beijing behind, you fly south to Xi’an, China’s first capital, home to the Terra-cotta Army—and to one of China’s culinary delights. Check into your hotel and then savor a traditional Xi’an dumpling banquet. Traditionally reserved for special occasions (perhaps because making them can be so labor-intensive), each little dumpling is a delectable work of art—and, after all, your visit to Xi’an is surely a special occasion, so you deserve every one of the 16 different kinds of dumplings that will be served. Xi’an’s terra-cotta army has been called the 8th wonder of the world, and it’s certainly the most extraordinary archeological find of the 20th century. Prepare to be amazed! You’ll also visit one of the holiest Buddhist temples in China, and enjoy a traditional Tang Dynasty dinner show with fabulous food, music and flamboyant costumes. In 1974 a farmer digging a well stumbled upon one of the 20th century’s most astonishing archaeological finds: a massive army of terra-cotta figures that stand guard over the tomb of China’s first emperor, Qin Shi Huang (259-210 BC). Though thousands of members of this army have been excavated so far, many more remain; work uncovering the tomb complex continues—and the emperor’s tomb chamber is yet to be revealed. Terra-cotta acrobats, musicians and officials were also created to accompany the emperor in the afterlife; all are now on display at a museum devoted to this incredible find. Each life-sized figure is unique—no mass production for those ancient craftsmen!—and as you explore the museum, you’ll be amazed by the intricacy of the workmanship. This terra-cotta army was by no means Qin Shi Huang’s only bequest to China: It might be fair to say that he created the nation of China itself. He unified a vast swath of the country and established the administrative systems that governed China until 1911. In fact, he even gave his dynasty’s name to the nation. Qin is pronounced “chin,” and it is from this name that the modern word “China” comes. Though the museum of the Terra-cotta Army may be Xi’an’s most famous destination, the Big Wild Goose Pagoda is its most iconic sight, and it’s also on your agenda for the day. One of the holiest Buddhist temples in China, Big Wild Goose Pagoda was built in the seventh century to house the Buddhist texts the temple’s abbot, Xuanzang, brought back from India, where he spent 16 years collecting them. He and his monks devoted many years to translating those texts into Chinese; their translations are still in use at the temple. Constructed of wood and white brick (all without mortar), the pagoda is an architectural wonder. It is located on the grounds of the still active Temple of Thanksgiving and boasts a park and large plaza where locals sometimes gather to fly kites. Remember to put a few coins in your pocket for this excursion—tradition says that throwing them through the pagoda’s window will bring you good luck. Who wouldn’t want to give it a try? Before you leave Xi’an for Chongqing, you have one more expedition: a visit to the Jade Carving Center, or Jade Factory, as it’s also known. Jade has been cherished in China for 10,000 years; it is valued for its intrinsic beauty, of course, but it also has tremendous symbolic meaning. Watch artisans carving intricate designs and learn what to look for when buying this special stone. Transfer to the airport and fly to Chongqing, where you’ll board your ship and settle into your Executive Suite. Do you believe in magic? The bright red Shibo Pagoda was originally built into the side of a mountain peak, but that peak became an island after the completion of the Three Gorges Dam. Step ashore here to do some exploring, perhaps climbing to the top to ensure that all your dreams come true (or so an ancient legend says). The capital of western China and one of the largest cities in the country, Chongqing on the upper Yangtze has seen explosive growth in the past half century. Although the city is a major metropolis, the region is chiefly known for its mountains, hot springs and dense forests, which shelter temples, tombs and karst caves. The Three Gorges – The Yangtze’s fairytale landscapesShibao Pagoda is a temple built directly into the side of a steep peak that is now an island, a result of the rising waters from the Three Gorges Dam. Painted a bright red (the color associated with happiness and good fortune) and featuring an elaborately carved entrance and unusual round windows, the 12-story pagoda is yours to explore. At one time the temple consisted of just the top three stories; the other nine stories were constructed essentially to house the ladder-like staircase that leads up to the top. It’s something of a challenge to climb, which may be why legend says reaching the top will make your dreams come true—by your being here, we’d like to think they already have. (Don’t worry—there’s another, less strenuous way to get to the top: You can take a path up the hill and cross a bridge to the temple.) Shibao Pagoda is, quite simply, magical. Enjoy the Captain’s Welcome Reception before dinner. Limestone cliffs, sheathed in greenery, loom above the water; mountains, wreathed in mist, tower in the distance. Every vista seems to be a traditional Chinese watercolor come to life. Climb aboard a small motorboat and enter a magical landscape as you drift quietly along the Goddess Stream, a tributary of the Yangtze that flows through some of the most extraordinary scenery in the Three Gorges region. Pristine turquoise waters shimmer and bubble between the sheer cliffs that rise high overhead. Mysterious traces of ancient peoples appear in the cliff faces, including coffins suspended among seemingly unreachable rocks. There are those who believe the goddess of the stream created some of the ravishing peaks you can see from your boat: Does Feifeng Peak look to you like a phoenix about to drink from the stream’s waters? Legend says that the goddess transformed a golden phoenix into the mountain. Whether you recognize a similarity or not, there’s no denying the enchantment of this region. Note: Due to water conditions, we may substitute a Shennong Stream boat tour if the Goddess Stream is not available. Today, you’ll disembark the ship in Yichang and explore the Three Gorges Dam on foot. Get ready for some spectacular views and the exhilarating roar of rushing water. 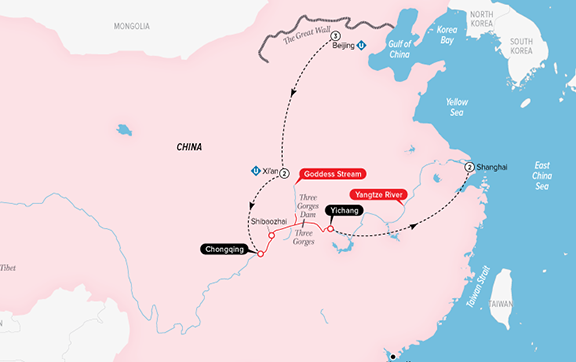 Known the world over, the dam harnesses the power of the mighty Yangtze in order to provide electricity to ever-growing China; it is the largest hydropower project ever undertaken. Talk of building such a system first began in 1919, but it wasn’t until 1992 that the Chinese congress gave it the go-ahead. It opened in 2006, with the final generators being installed in 2012. The dam is also intended to control flooding on the Yangtze, which has been a severe problem for many centuries. It has not been without controversy, but it is an unparalleled expression of national ambition and a major new national landmark. 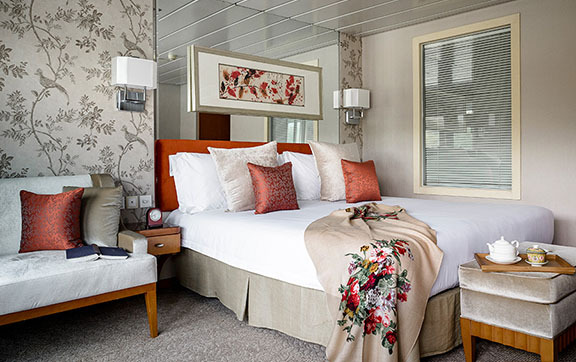 After your visit to the dam, you’ll fly to Shanghai, where you’ll settle into your room and relax. After days of pandas, ancient warriors and timeless Chinese landscapes, Shanghai and its futuristic skyline can be something of a shock to the system. Yet beyond the building boom and the avant-garde architecture, you can still find traces of Shanghai’s colorful and fascinating colonial-era history. Enjoy a taste of both old and new today, as well as dim sum and a performance by the gravity-defying Shanghai acrobats.